An additive measure of volume for a product mix. Does it matter which 80% we are talking about? 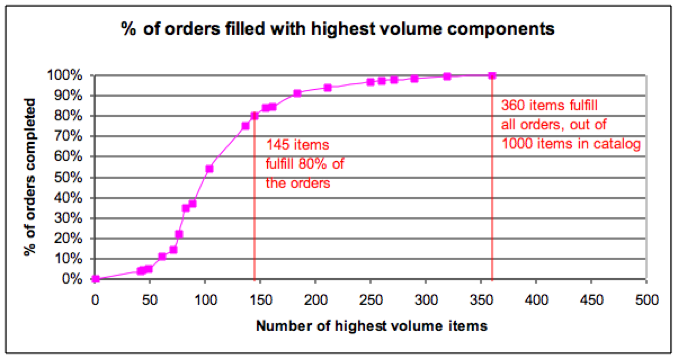 When Kevin Hop and I were consulting for Dell back in 2002, engineer Paul Friedman showed us a plot he had drawn of the proportion of orders that could be built complete with a given fraction of the overall component list. 80% of the desktop computers shipped by the Parmer North (PN2) plant could be assembled with only 145 of the 1000+ components in the catalog, and 100% could be assembled with only 350. When we spoke, Friedmann wasn’t sure how to exploit this information. Later, he and Dave Schneider used it as the basis for an automated line at PN2. This is essentially Ed Frazelle’s item order completion distribution applied to the special case of delivering components to assembly, as opposed to general warehouse operations. In general, picking orders can be and often are for single items. In assembly, they are for bills of materials, which gives the distribution a special shape. We were impressed that he had found a way to plot this chart. Finding the list of items with which you could assemble everything was straightforward enough. All you had to do was filter all the components that weren’t used in any. Finding the minimal set of components with which you can assemble 80% of the computers, on the other hand, didn’t seem obvious. Friedman’s curve looked like Figure 1. Near 0 on the x-axis, you don’t have enough items to build any product. The curve, therefore, starts flat at 0% near the origin. 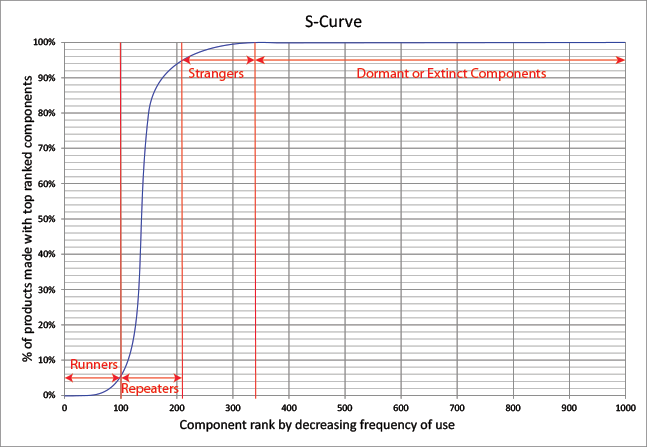 The component frequency-of-use curve usually has a long tail of components that are hardly ever used. You can build almost everything without these components. For this reason, the tail of Friedman’s curve is also nearly flat close to 100%. Two-thirds of the items in the component catalog were not used at all to meet the recent demand he analyzed. Dormant items commingled with active ones clutter the catalog and distort the answers to basic queries like “How many component items do we buy to meet demand?” The true answer is 350 but the planning system will respond “1,000” because it’s the number of items in the catalog. It is easier to get a true picture of the supply chain if these items are set aside in a catalog archive, from which they can be retrieved if needed. In the meantime, you do all planning and analysis using only the items that are actually used. In the example Paul Friedman showed us, this would reduce the size of the catalog by two thirds. The key point, however, is a clearer picture of the real situation. It’s not saving disk space. The main use we found of this curve is as a basis for breaking components down into Runners, Repeaters, and Strangers in a way that is connected to product demand, rather than with arbitrary boundaries. At this point, the component ranks on the x-axis must be by overall decreasing frequency of use because it’s where we want to put thresholds. Ordering them on a replenishment basis, using Kanbans, reorder-points, or vendor-managed inventory methods. Assigning dedicated locations by the line side wherever they are needed. You rarely need the bottom-ranked components on the right. You can meet most of your demand without using any of them. Whichever measure of volume you use, it’s fair to call Strangers the items without which you can meet, say, 95% of the demand. You may then place orders for Strangers in response for customer orders for products that use them, in the exact quantity needed, and deliver them directly to production on receipt. If suppliers force you to accept minimum order quantities in excess of your immediate need, you have to store and retrieve the Strangers but you do it in a small, separate warehouse, with slots allocated like hotel rooms, and no systematic replenishment. In-between, the items that are neither Runners nor Strangers are your Repeaters. Each may have a dedicated location but in a kitting area rather than at the line side. The categories of components identified through Friedman’s curve are shown in Figure 2. To show the use we make of the Friedman curve, we glossed the challenges of generating them in a meaningful way. We address them here. What does “80% of the demand” mean? Is it in terms of sales, value added, number of pieces,…? Which 80% is it? You could conceivably build 80% of the number of pieces on order and it could not include deliveries to a strategic customer. How do we sort the components in order to say that a particular subset is “the top 145”? Relevant geometrical dimensions, like length, area, or space. You then assign a relative weight to each product and make their volumes additive. It’s not trivial but, for the sake of this discussion, we’ll assume we have a reasonable way of saying the Product P accounts for x% of the demand. Friedman’s Dell plant assembled custom-configured desktop computers ordered online. There were a few base models like Optiplex or Dimension with many hardware configurations of processors, memory, storage, input/output ports, etc. Since there were no major differences in the value added or the labor needed to assemble the different configurations, adding piece counts made sense. As we understood it, the company’s strategy was to deliver all orders promptly enough to avoid putting any of a fast track. Consequently, it didn’t matter which 80% we were talking about. More generally, which 20% of the products account for 80% of the demand is an issue for Product-Quantity (P-Q) analysis. This is not the topic here. Our concern is components and their frequencies when delivering all orders. Dropping products from the demand is not a consideration. The y-axis just shows how much of the demand can be made with the most frequently used components, in terms of the additive measure of volume discussed above. 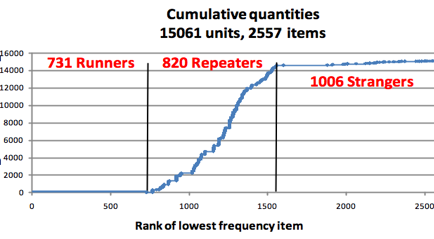 For components, the Runner/Repeater/Stranger analysis is based on frequency of use. This means, per unit time, the number of product units that use any quantity of this component. It’s not about the total quantity used. It doesn’t make sense to compare a number of screws with a number of engines but it does to compare the number of product units using a type of screw or an engine. It is how you have to organize supplies. In this sense, the “top 145” components are the ones operators reach for the most often, regardless of how many they pick at a time. A product demand, expressed in additive units of volume, as discussed above. Thresholds for Runners and Strangers in terms of the proportion of products built. If you set the Runner threshold to 0%, you restrict the Runners to the set of the most frequently used items without which nothing can be built. It is a useful category, but not one to which you would dedicate a line. If you set the Strange threshold to 100%, then you equate Strangers with dormant or extinct items, categories that call for different treatments. We turn the list of BOMs into a matrix with a row for each component, a column for each product. Then we replace all the positive quantities with 1s. A 1 means that the component is used in the product but doesn’t say in what quantity. Using the product demand, we aggregate the number of uses for each component for the total demand and rank the components by decreasing total use counts. For each product, we then find the lowest-ranked component used to assemble it. This tells you how far down you have to go in the list of components ordered by decreasing frequency of use in order to make this product. We then summarize the cumulative volumes as a function of this rank. The table of proportions P of the demand built completely with only the n most frequently used components. 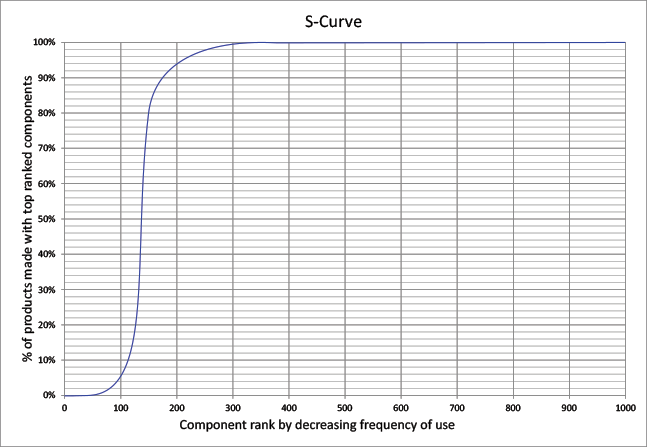 Its graphic representation as an S-curve. The actual plots are not as smooth as in the above figures. Figure 3 is the original computer assembly S-Curve that inspired us to use this technique. Engineers relate to Friedman’s curve but we have found that it is also a curve that only engineers can love. It confuses others and makes them reluctant to use it. It’s just difficult enough to generate with Excel to deter most manufacturing professionals. We have found it more effective to first show the actionable conclusions about logistics and supply chain management, and keep the chart in reserve to answer questions about the basis of these conclusions. The figures don’t show up for me. And right-clicking them > View image results in a “Bad request page”. Sorry, I can’t replicate this.